Home > Science & Nature > Geography > Oil Rig Explosion Today Video & Pics? An oil rig exploded and burned off the Louisiana coast today, the second such disaster in the Gulf of Mexico in less than five months. All 13 crew members were rescued. At first they say that there was a big oil spill after the explosion happened, but later reports said there was no oil spill. The fire burned for several hours before it was extinguished. A company spokesman said the explosion happened on an upper deck of the platform where living quarters were located. Can anyone link to the video or pictures of today's Mariner Energy Oil Rig Explosion? The company that owns the platform, Houston-based Mariner Energy, did not know what caused the explosion. Earlier reports from the U.S. Coast Guard had suggested that an oily sheen was seen near the site, sparking fears of another oil spill like the BP's Deepwater Horizon Spill, just east of this explosion. A mile-long plume with a width of about 100 feet was reported by the rig's owner, Mariner Energy of Houston. An oil industry vessel that was nearby plucked the crew members out of the water and brought them to a nearby platform. Despite years with no major accidents, the offshore oil industry will now be forced to recover from a stigma that it's accident-prone and can't be trusted. BP has a reputation for costly mistakes. Mariner, a smaller independent company based in Houston, also has had numerous run-ins with regulators for safety issues. One of the pictures of today's oil rig explosion. Unfortunately, there's no video of the explosion. 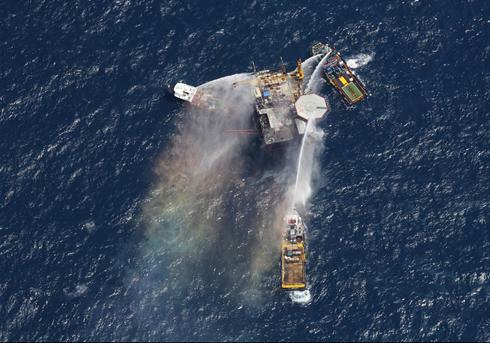 Similar Threads for: Oil Rig Explosion Today Video & Pics? Moscow Subway Bombing & Explosion Video? Middletown CT Power Plant Explosion Video? 2010: Space Shuttle Launch Today Video? Explosion in Puerto Rico Video?